HNLMS Gelderland (Dutch: Hr.Ms. Gelderland) was a Holland-class cruiser of the Royal Netherlands Navy. During its career in the Dutch Navy it was most notable for being the ship Queen Wilhelmina sent to South Africa to transport Paul Kruger to Europe during the Second Boer War. The ship was taken over by the Germans during World War II and renamed Niobe. She was sunk in Kotka harbour in Finland on 16 July 1944. The ship was built at the Maatschappij voor Scheeps- en Werktuigbouw Fijenoord in Rotterdam and launched on 28 September 1898. The ship was commissioned on 15 July 1900. On 22 November that year she arrived in Marseille with Paul Kruger who she had picked up in Lourenço Marques by order of the Dutch Government. After dropping Kruger off she left for the Dutch East Indies. During this trip while entering the harbor of Port Said she collided with the British steamer Peterson. The collision required the ship to be repaired at Suez. On 6 January 1901 she could resume her journey and arrived three days later on 9 January in Surabaya. On 6 July 1904 Gelderland and Utrecht both ran aground near Aroes Lampoejang, South Sumatra because of incomplete maps. The ships were repaired in Surabaya and Singapore respectively. On 17 June 1905 Gelderland and her sisters Noordbrabant and Utrecht returned to the Netherlands. The journey involved stops in Tanjung Priok Mahé, Perim, Port Said, Algiers and Tangier arriving at Den Helder on 30 August that year. 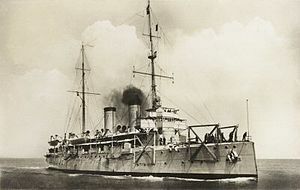 In 1908 Gelderland, together with her sisters Friesland and Jacob van Heemskerck, was sent to patrol the Venezuelan coast during the second Castro crisis. On 17 June 1911 Gelderland left Rotterdam for England. On board was Prince Henry of the Netherlands who traveled to the United Kingdom to attend the coronation of George V. For the last part of the journey Gelderland was escorted by four British torpedo boats. Gelderland was sent to Constantinople on 11 November 1912 because of rising political tension and a direct war threat. A landing party of 100 men was put ashore and took position in the legations section of the city on 18 November 1912. She was relieved by Kortenaer on 30 May 1913. While patrolling along the Dutch coast an explosion occurred on 14 March 1917, killing one man and severely wounding nine others. After returning to port the ship was taken out of service for maintenance. After World War I she served as an artillery training ship in the Dutch navy. The ship was seized by the Germans during their invasion of the Netherlands in 1940, and Gelderland joined the German Kriegsmarine under the new name of Niobe. She was in use between 1940 and 1944 first as a cruiser, then as a training ship, and finally as an anti-aircraft cruiser ("Flakschiff"). During the Vyborg–Petrozavodsk Offensive of 1944 the Soviets tried to finish the Continuation War with the Finns. The Germans came to the aid of the Finns, and, among the materiel brought with them, was the anti-aircraft cruiser Niobe, which was ordered to strengthen the air defences of Kotka, then one of the most bombed cities in Finland. At the same time, the Soviet Union had put much emphasis on finding and sinking the Finnish coastal defence ship Väinämöinen. Soviet aerial reconnaissance identified a large ship in Kotka harbour and the decision was taken to attack, with 132 bombers and fighters (sent by, amongst others, the 51st Mine-Torpedo Aviation Regiment of the Red Banner Baltic Fleet), on 16 July 1944. The ship was, however, Niobe, and the aircraft were met with fierce resistance. An A-20 Havoc bomber was shot down, but the ship was hit and sank. The guns of the Niobe were still firing as she settled in the shallow water, after which, much of her superstructure remained visible above sea level. Seventy of the crew of the Niobe died. Niobe was raised and scrapped in 1953. ^ "scheepvaartmuseum.nl :: Maritieme kalender 1898". Retrieved 15 October 2013. ^ "scheepvaartmuseum.nl :: Maritieme kalender 1900". Retrieved 15 October 2013. ^ "scheepvaartmuseum.nl :: Maritieme kalender 1904". Retrieved 15 October 2013. ^ "scheepvaartmuseum.nl :: Maritieme kalender 1905". Retrieved 15 October 2013. ^ "scheepvaartmuseum.nl :: Maritieme kalender 1908". Retrieved 15 October 2012. ^ "scheepvaartmuseum.nl :: Maritieme kalender 1911". Retrieved 15 October 2013. ^ "scheepvaartmuseum.nl :: Maritieme kalender 1912". Retrieved 15 October 2013. ^ "scheepvaartmuseum.nl :: Maritieme kalender 1917". Retrieved 15 October 2013. ^ "bellabs: Архив 51-го минно-торпедного авиаполка КБФ". Bellabs.ru. Retrieved 4 May 2013.